This strange rock formation has people all over puzzled. Just how did it end up like this? Located in Tayma oasis, Saudi Arabia this is one of the most photogenic petroglyphs in the whole area. The formation seems to be split making up two standing stones. The flat faces, while they appear to be cut by a laser, are actually completely natural. These boulders are held up by what looks like small pedestals and no one is sure as to how they ended up this way. 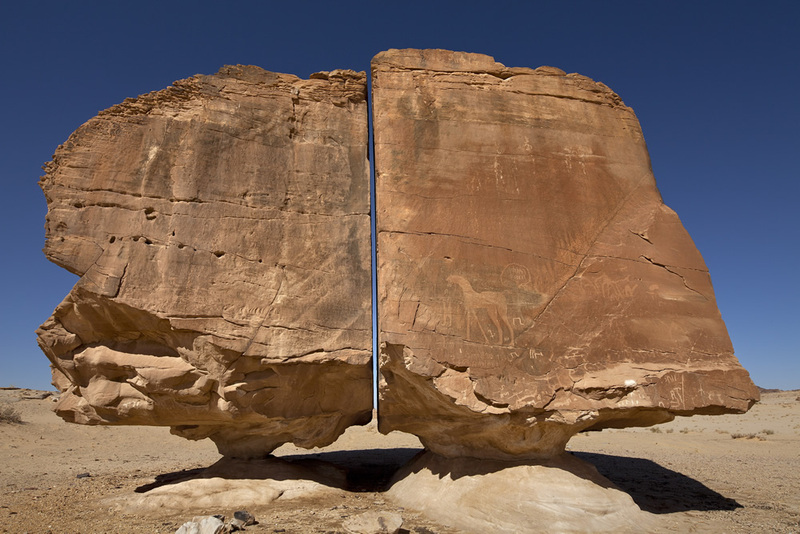 We assume that the ground shifted underneath them ever so slightly causing the rock to split. This could be a pressure crack, fault line, or well anything you could imagine really. Thousands of people venture out to see this interesting stone each year and with good reason. It is a sight well worth seeing. Could it have been worked on at some point with some sort of precise ancient tool? While we do not know now the exact cause with the ever improving world we live in I am sure someday we will. What do you think about this? How do you think this may have been formed? Look at how perfect that line is, isn’t it intriguing?